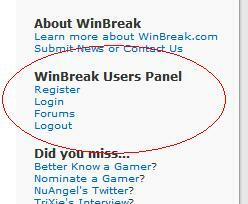 New WinBreak.com features, new forums! In an attempt to make your life easier, entice you to visit this site, and in an all around attempt to satisfy the masses, I have made several changes to the site over the last week, though many of them may not be noticable just yet. First: the site is now mobile-web friendly! As my recent exploits with my own mobile phone grow, so does my conciousness of mobile-device users. You don’t have to go to a special “NuAngel.net/xyz” or “mobi.WinBreak.com” or anything fancy – just load up WinBreak.com on your phone, PDA, or even PlayStation Portable, and keep up on the latest information. Next: I have expanded your user profiles to allow a little more customization. You should now find it easier to describe yourself, promote your interests, and even show off a little bit! Finally: NEW forums! The last ones were never very busy, but they were very buggy. So I found it was a good idea to try and simplify a few things. While it still needs some work, it’s far less buggy and is driven off of the same database as the main website. If you’re registered and can leave comments on the blog posts, you’re registered for the forums! So why not just register, login, and visit the forums! ELSPA says video game ads are A-OK! WBX: Halo’s "CALL TO ACTION" on Windows and Xbox?